We knew we Steve Jobs would be sharing a re-vamped mobile Google search on the iPhone at the WWDC in 2007 (in order to showcase the technical possiblities mobile Safari offered at the time, by far the best of breed for the moment). Google wanted to put on a good show, and I was fortunate enough to be chosen to lead the effort. My time in Google's Mobile Design group (where I spent the majority of my time at Google) was exciting, challenging, and everything you could want in terms of a consistently stimulating work environment. My first project at Google was to partner with a Product Manager in order to re-think several of Google's mobile offerings (Primary, One Google, Search and Apps) for the iPhone. My responsibilities included developing the overall design language for our high-end device (at that point, iPhone) Mobile Web experience, as well as working with teams around the company to coordinate on translation of key properties to the mobile web (One Google, Search and Apps). 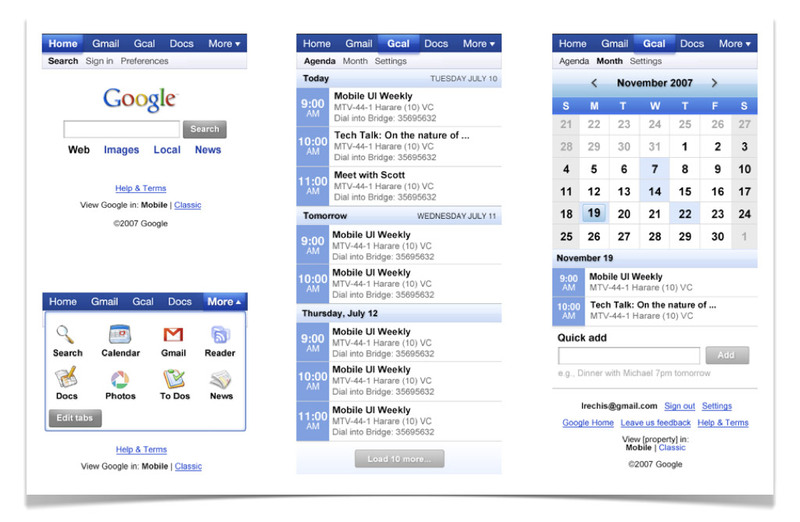 For example, in leading the redesign for mobile Google Calendar (for which the original 2007 design still in use today), I coordinated with my desktop Google Calendar design counterpart to be sure the proposed design direction was collaboratively driven and inclusive of their latest thinking. Out of this work also came a set of Google mobile web design standards, which would be used companywide when designing for mobile devices. I also prototyped (HTML, CSS, JS) each of the products I was redesigning for mobile web. experience, shown at WWDC 07. Google Mobile Web applications, the early days. Design for Google Suggest on the phone. Design for Image Search on the phone. Design for Local Search on the phone. In 2010, I was asked to head to Beijing for an extended, three month project with two aims: supplement and mentor the relatively junior Google Beijing design team, and propose a project which might help to move the needle in terms of Google's fledgling presence in China (in 2010, Google was a far fourth or fifth brand-wise to native Chinese incumbents like Baidu). I was honored to be asked, and spent much of the time in the field with my research partner, George Zhang, speaking with Chinese university students about their hopes, fears, dreams and desires (technologically). 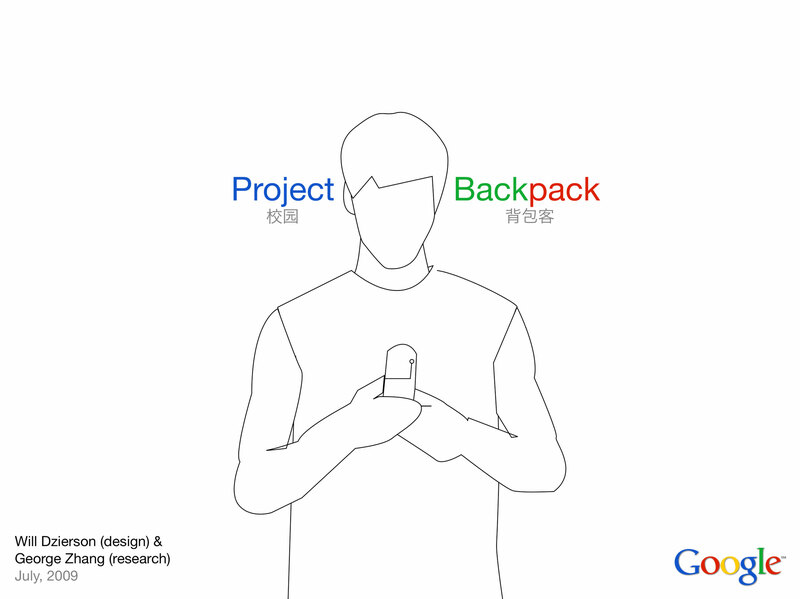 We nicknamed the endeavor Project Backpack (校园 背包客) because we were trying to find some way to tap into a product or experience that the students would want to have with them as much, and use as much, as a simple backpack. We chose university students because they represented the most favorably impressed cross-section of the population at that point, and also a fertile opportunity if we were able to further win their loyalty through great, useful products. This is a presentation which summarizes some of the partnered work we did in the field. The design concepts were our collective work, their actual design was my contribution. the PDF and view the project work. Alongside the projects I was lucky enough to work on, the culture of the company has stayed with me to this day, and I openly acknolwedge having brought aspects of the experience I had while there to subsequent employers and environments, like starting a regular speaker series wtih an emphasis on lifelong learning, or promoting a focus on company culture & values (both of which I helped to implement at recent companies).